Among the new 4K UHD projectors using the 0.47" DLP chipset the Optoma UHD50 is uniquely impressive for several reasons. It has lens shift which the others do not, it has a noticeably deeper black level, and it has the lowest fan noise in the group. In addition, there are no obvious flaws -- the picture is sharply focused from side to side and top to bottom, there are no hot spots or fading on the edges, and color balance is reasonably well-tuned right out of the box so you can fire it up and get into an enjoyable big screen experience without worrying about calibration if you don't want to. Another key feature that will generate buying decisions in the UHD50's favor is its short throw ratio -- it can fill a 120" diagonal screen from a throw distance of as little as 10.5 feet while competing units like the ViewSonic PX727-4K and BenQ HT2550 require about 13 feet. So buyers with smaller rooms can get a bigger picture with their available throw distance from the UHD50. Moreover, the Optoma UHD50 is a handsome unit -- a beautifully designed and crafted machine that simply looks and feels good. Thus, for a variety of reasons, the Optoma UHD50 at just $1499 is a unique and excellent value in home theater projectors. Brightness. The Optoma UHD50 is rated at 2400 lumens. As is typical, this projector has a very bright factory calibration, called "Bright." The brightest modes on most projectors tend to be skewed toward an obvious green and this one is no different. You won't want to use Bright mode for any video display unless you don't mind a green picture. The UHD50 has a ten-step Brilliant Color feature that defaults to the maximum of 10 in all modes except Reference, in which it is turned off. In Cinema mode, at Brilliant Color's maximum of 10, color brightness is equal to 80% of white which is still sufficient color in the signal to render very good saturation. If you reduce Brilliant Color to 3, color brightness equals 100% of white, and total ANSI lumen output is reduced by 19%. There is an Eco lamp mode which reduces lumen output by about 33%. Zoom lens light loss. The UHD50 has a 1.3x zoom lens that loses 11% of the projector's potential light output at the telephoto end compared to the wide angle end. Picture Quality. The overall picture quality with conventional SDR 1080p sources is pleasing and engaging at 120" diagonal. One primary benefit is that the upscaling of HD 1080p material to 4K produces an incremental sharpening and clarifying of the picture. Upscaled 1080p is not as sharp as a native 4K signal, but it is a clear improvement over 1080p resolution projectors. Color balance out of the box on the UHD50 is particularly good compared to some competing units we've seen. It is certainly watchable in factory defaults. No significant recalibration is required to eliminate obvious color errors. Our test unit showed flesh tones that were a bit overdriven in red and needed a touch of blue, but minor adjustments to red and blue gain balanced it out. You may want to adjust the color saturation control to your taste based on the size image you are projecting. Contrast is best described as adequate. It is sufficient to avoid muddiness in shadow details, but not as high as one might expect from a projector with a contrast rating of 500,000:1, and not as high as home theater projectors in the higher price ranges. On the other hand, when a largely black image appears such as a title screen or rolling credits, the black level is quite solid and satisfying. When you are in Cinema mode and Brilliant Color is set to its default of 10, large white objects in the image appear brighter than they should relative to colored elements. Some people do not mind this effect as it gives the picture an added "pop," but those looking for optimum balance may want to pull Brilliant Color down to 5 or 6. This will reduce the brilliance of white without having much effect on the brightness of color, and the result is a more balanced picture overall. This projector has an Ultra Resolution function which essentially sharpens the picture. The default is Off, with options of 1, 2, and 3. By setting Ultra Resolution to 1, the picture from 1080p sources is improved in sharpness without introducing significant noise. The UHD50 has a color mode called HDR Sim which is an option for non-HDR source material. HDR Sim sounds like an intriguing feature that would lend some extra contrast to an SDR source, which it does. Compared to Cinema mode it alters the gamma, reduces color saturation, shifts color balance, and adds a bit of harshness. Some users might like this effect on some material. Overall, the integrity of the picture was compromised in this mode and we preferred to avoid it and stick with the more refined Cinema mode. In order to optimize results, use this projector in a dark viewing space with no ambient light. We would not push image size much beyond 120", as the larger one goes it lowers effective contrast. 4K HDR Performance. On the UHD50, the HDR picture is a moderately higher contrast image than you get with non-HDR sources. So it is an appealing feature, and combined with the 4K resolution it delivers a beautiful picture for the money. None of these new low priced 4K projectors match the dynamic range of the more expensive home theater projectors from Epson, JVC, or Sony. And none of them (thankfully) replicate the extreme HDR pictures seen on flat panel TVs, which tend to look supersaturated, digitally over-manipulated, and basically fake. The HDR on the UHD50 is competitive with the other 4K projectors but not uniquely exceptional. You get an attractive higher contrast image image than you get with SDR sources. The picture looks naturally balanced and not overprocessed. It is mandatory to watch this picture in a dark viewing room in order to get the maximum benefit from the HDR. Once you introduce ambient light the difference between HDR and SDR rapidly diminishes. As noted elsewhere, due to the non-standardized output levels in HDR source signals, we see variations in color balance, color saturation, and ideal brightness/contrast settings from disc to disc. Each projector tends to interpret these a bit differently, and there is no such thing as an ideal HDR calibration that displays all HDR sources optimally. So the UHD50, like all projectors, typically benefits from a few tweaks to the basic contrast, brightness, and saturation controls to accommodate each individual disc. Brightness Uniformity. The UHD50 measured 77% at the telephoto end of the zoom and 73% at the wide angle end. There is no visible hot spotting or fading when viewing a 100 IRE white test screen. The image is brightest at the bottom center and gradually decreases toward the upper corners, but the shift is so gradual as to require a meter to detect it. Image Sharpness. A grid test pattern is easy to focus sharply from top to bottom and side to side. We see no deficiencies in focus. Input Lag: The UHD50 measured 57 ms input lag. This is fine for most casual gaming, but serious or professional gamers will probably want a faster unit. HDMI Port Bandwidth. One of the two HDMI ports on the UHD50 is HDMI 2.0 with HDCP 2.2 to accommodate native 4K playback, and has a bandwidth of 17.8 Gbps according to Optoma. Rainbow artifacts. Rainbows are very low on most DLP home theater projectors these days, including the UHD50. However some people are uniquely sensitive to this artifact, and there is no way to predict whether you may be one of them. If you are uncertain, buy from a reseller with a friendly return policy so you can test it out yourself. Fan noise. The UHD50 and its bigger sibling the UHD60 are the quietest of the new 4K projectors under $2000. In Bright mode the UHD50 is impressively quiet, and when switched to Eco mode it goes almost silent. On board Audio. The UHD50 has two 5W speakers, one mounted on each side of the unit. They can give you a decent sound track, but the audio is thin and not overly loud even at full volume. The large screen experience you get from the UHD50 is best enjoyed with a full surround sound system, or at the least a high quality sound bar or external stereo system. Lamp Life and Replacement Cost. Optoma is quoting 4000 hours of lamp life in Full lamp mode, and 15000 hours in Dynamic Black mode, which is the mode most users will opt for. With a 15000 hour life you will probably upgrade the projector before you ever get around to replacing the lamp, but in the event you need a lamp, the replacement is currently priced at $199. Warranty. The Optoma UHD50 comes standard with a one-year warranty. The UHD50 has a 1.3x zoom and some limited vertical lens shift range, which in combination give you incrementally more placement flexibility and a bit easier time with installation than the competing 4K projectors that have 1.2x lenses with no lens shift. When vertical lens shift is at its minimum position, the centerline of the lens intersects the screen a couple of inches below the bottom edge of the projected image. From that position you can use the vertical shift knob to elevate the image a range of about 12% of the image height. So for a 120" diagonal image, you can raise it about 7" (or lower it about 7" if ceiling mounted). This projector has a 1.3x zoom lens that will throw a 120" 16:9 image from a distance of about 10.5' to almost 14'. If you have your seats about 1.25x the screen width (a comfortable viewing distance for many people), they would be about 11 feet from the screen. So the projector would be positioned either directly above or just behind the seating area. To check the throw distance required for your desired screen size, see the Optoma UHD50 Projection Calculator. Due to the offset that positions the image entirely above the centerline of the lens (or below it if ceiling mounted), the ideal installation in many cases will be a ceiling mount. However, since the UHD50 has a shorter than typical throw ratio, placing the projector on a low table between the seats will work nicely also, and save you the cost and hassle of installing a ceiling mount. The low fan noise makes the projector easy to live with in such close proximity to the seats. Keep in mind all projectors throw off heat. The exhaust on the UHD50 is not oppressively warm, but nevertheless you would want to give it at least two feet clearance for heat dissipation if you were placing it adjacent to seating. It is also possible to place the UHD50 on a rear shelf or stand behind the seats and project over the heads of the viewers. However this will usually require a downward tilt of the projector in order to hit the screen. If you do this, you can use keystone adjustments to square up the resulting trapezoid. This is not an ideal solution for installing any projector since aggressive use of keystone adjustments works by deactivating a portion of the display and compressing the image. So it reduces lumen output and pixel resolution. If you can avoid the use of keystone adjustment, that is ideal, otherwise keep it to a minimum whenever possible. Dark frame around image. All of the new 4K projectors using the 0.47" DLP chipset throw a very dark but not perfectly black frame around the projected image. The frame is about 4.5% of the picture width. So for a 120" diagonal image (105" in width), the projected dark frame is almost 5" wide around the entire active area of the 16:9 image. If you are projecting onto a screen with no black frame, the projected dark frame from the projector will fall onto the wall around the screen. If the wall is white and you are in a dark viewing room this may be visible, though it is quite dim. Due to the incrementally deeper black level on the UHD50 compared to its direct competitors, this dark frame is darker and dimmer on the UHD50 than on the others. No Full HD 3D. To the dismay of 3D fans, many of the new lower priced 4K projectors lack Full HD 3D capability, and this is one of them. 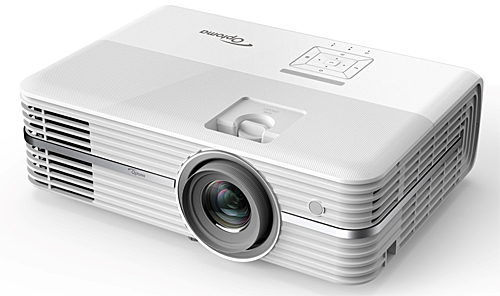 This projector will do PC-ready 3D, but not 3D from a Blu-ray player. If you are budgeting below $2000, your 3D + 4K options at the moment are the BenQ HT2550 at $1499 and the Epson Home Cinema 4000 at $1799. Weak onboard audio. The audio volume and dynamic range is not bad compared to many projectors this size, but it is not sufficient to give you the big sound that you'd want to have with the big picture. On the other hand, most premium home theater projectors have no audio at all since they are expected to be used with surround sound systems. Hopefully this one will be as well. Limited Warranty. With Viewsonic, BenQ, and Vivitek all offering 3-year warranties on their 4K projectors, and Epson offering a 2-year warranty on the HC 4000, Optoma's one-year coverage on the UHD50 is minimal. 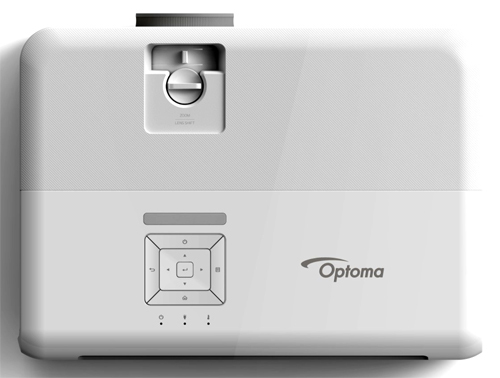 The Optoma UHD50 is unique among the new crop of inexpensive 4K UHD projectors featuring the 0.47" DKP chip as the one with the deepest black levels and lowest fan noise. A lot of folks will buy it simply for those two advantages alone. But beyond that its 1.3x zoom and modest lens shift will make it easier to install. It also has a shorter throw ratio than the competition--while the others require a 13' throw distance to hit a 120" diagonal screen, the UHD50 only needs 10.5'. So it may fit better into smaller rooms where space is a premium. The shorter throw distance also makes placement on a low shelf between the seats a viable option that saves the cost and hassle of a ceiling mount. Beyond that, the Cinema color calibration right out of the box is reasonably well-balanced, enjoyable and easy to watch, so you can set it up and immerse yourself in your favorite movies with little muss or fuss. This combination of features makes it an excellent value for $1499. This is not to say that the UHD50 is "best in class" in every aspect. The Viewsonic PX727-4K tends to have higher contrast and three-dimensionality within a given frame, and color saturation is deeper. It also appears incrementally sharper when they are placed side by side, although you need to see them side by side to tell the difference. The PX727-4K has a clarity, smoothness, and stability that the UHD50 cannot quite match. So the PX727-4K will appeal to the serious videophile despite the UHD50's advantages in black level, fan noise, and installation flexibility. On the other hand, the Optoma UHD50 beats the PX727-4K on a number of parameters that many buyers consider constitutional. For many, getting the deepest black possible in images with a lot of black is paramount, and the UHD50 edges the PX727-4K on this count. Many are extremely sensitive to fan noise, and the UHD50 is the quieter of the two. Some say lack of lens shift is a deal-breaker, and the UHD50 has it while competing units do not. Clearly the shorter throw ratio of the UHD50 will be a decisive factor for some buyers. On top of these obvious advantages, when you fire up the UHD50 it looks perfectly sharp with sufficient color saturation and contrast. Your reaction, if it is like mine when I first turned it on, will be "Wow, that's a great picture." So the Optoma UHD50 holds its own as a highly competitive offering in the low priced 4K projector horserace. If you pick one up, we are certain you'll feel your $1499 was money well spent. Finally the review is posted! Yay! Great review thank you. I’m glad that you addressed the light bleeding issue that many users are complaining about as it’s more of a DLP limitation for that TI chipset. Hi Evan, thank you for this review! I am stepping up to 4K/UHD from a BenQ W1070 after many years of enjoyment and don't have the desire to spend $4000-5000 on a full 4K projector like the Sony line-up, or the "top of the line" pixel shifters like the JVCs. So, the UHD50 and UHD60 are both very interesting to me. Do you think the UHD60 is worth the $380 (CAD) premium over the UHD50? Thanks! Sam, in my personal opinion the UHD60 is definitely worth the incremental price. It is much brighter and higher in contrast in cinema modes. Most people looking at them side by side will prefer the UHD60. The UHD60 does not focus precisely from edge to edge like the UHD50 does, but you have a hard time noticing the problem because you don't normally focus your eyes on the corners or edges of the screen, and the 60 looks perfectly sharp throughout the main sections of the image that you do normally focus on. Sam I think the UHD50 has more benefits per trade off. One for gaming at 48ms in 4K confirmed by Optoma support and the other for ease of setup (quiet fan, short throw, lens shift, smallest form factor) and long term use. You get 15,000hrs for a $200 USD lamp replacement! The UHD60 lamp flickers on eco mode so you’ll be in the 4000hrs range at more costly lamp replacement. Obviously UHD60 is a better performing machine but everyone’s needs are different. Tim, there is no frame interpolation on either the UHD50 or UHD60. You need to step up to the UHD65 at $2295 to get that feature. And yes, it works very well on the UHD65. None of the 4K UHD DLP models under $2000 have frame interpolation. Only the Epson 4000 has it, which is 4K compatible and not quite as razor sharp as the models with the 4K DLP chips. But it has Full HD 3D, Lens Memory, extensive zoom and lens shift, deeper black levels, brighter picture, etc.-- a variety of features the 4K DLP models do not have. So it is a trade off. I have owned the Optoma UHD50 since December 3rd and am very pleased with its picture, but I have a few questions about using its remote. For instance, how do I access Brilliant Colors ten steps? I also have never gotten sound out of its speakers. Could this be because I only use its 4K input? Bill, assuming the menu system follows the usual Optoma scheme you can access the Brilliant Color setting by hitting the Menu button then accessing Image and then scrolling down to Color Settings. To hear sound from the internal speaker, you hit the Menu button, scroll down to Audio settings and one of the options will allow you to turn the internal speaker on or off. If it's set to Off, turn it on. If you're not hearing anything, your source component or AV receiver if you're using one is not sending audio from the HDMI source component through to the projector. This requires a different audio setting in the source component or AVR. After reviewing the Vivitek HK2288 and the Optoma UHD51/50. If you can please give your preference in details since I am debating between the 2 projectors. We have no direct comparison of these two by which to go but you may infer some things from the shootout we did between the HD2288 and UHD60. There is no significant benefit in apparent resolution between the .66 and .47 DLP XPR chips. However, some observers suggest that, besides the higher light output the .66 chip affords at the designer's discretion, the two-phase pixel-shifting scheme used may provide some benefits in terms of color saturation vs. the .47-inch chip's four-phase shifting. But these differences would be subtle at best and not necessarily detectable from one manufacturer's projectors to the next. Hi, thanks for all the great work through all the years. I am in process of upgrading from my trusty Optoma HD65 (recommended on projector central like a decade ago) to either Optoma UHD50 or UHD60. I want to be future ready (4k) but to tell you honestly, almost all of my current movie collection is 1080p and movies I already have as 1080p I will not be buying as 4K again (maybe just a couple :)). So, considering that chip on this thing is basically 1920x1080 and it has that 4 phase pixel shifting thing to make it 4K, while UHD60 has 2560X1600 pixels and 2 phase pixel shift, does this mean UHD50 makes a simpler work (something like not going through pixel shifting) when showing 1080p source? While UHD60 needs to downsample and in that effort probably making 1080p content less sharp then looking at UHD50? Texas Instruments promotes the idea that the .66 inch chip that does 2-phase pixel shifting allows for brighter projectors than the .47-inch chip that does 4-phase pixel shifting. I've had it suggested to me by some observers that the larger, 2-phase chip can deliver images with slightly better contrast and color resolution, but that's a difficult theory to test short of having two precisely identical projectors whose only difference is the chip used.